This page is designed for current and prospective partner restaurants and vendors. Please take a moment to enjoy the video below. Note the layout of our kitchen, serving style, seating arrangements, joy and Holy Chaos of our community meals. If you’re just starting to learn about the Downtown Welcome Table, you may want to visit this page. If you’re interested in becoming a Downtown Welcome Table partner, but wondering how food and labor costs will be compensated, click here. Use the button below to access our meal form and information specific to food quantity and preparation. For answers to other frequently asked questions, click here. We recognize the level of dedication and generosity it takes to be a Welcome Table partner. Some restaurants ‘team up’ so as to help spread the joyful weight of producing such a large-scale meal. 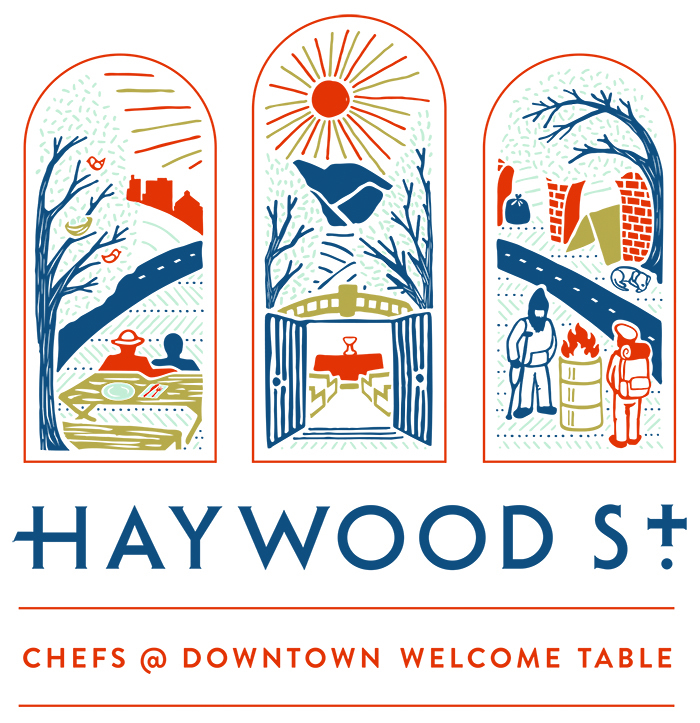 If the requirements of the Welcome Table meal simply do not work for your establishment, please note these additional ways of sharing grace through food at Haywood Street. Haywood Street Respite is an eight-bed, safe space designed for unhoused individuals to recover from acute illness or injury. Every evening, dinner is shared ‘family-style’ around the kitchen table. We believe these meals to be a powerful component of healing and essential to the establishment of community. Our Meal Train format allows for easy sign-up. We ask that meals be delivered between 5:30 pm and 6:00 pm and that 20 servings be provided. 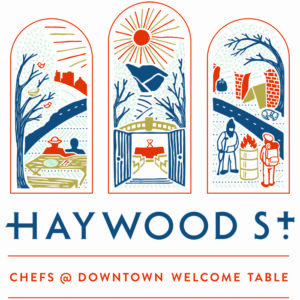 Please know you are always invited to take a seat and share this food and time with Haywood Street friends. For more information, contact Hannah at hannah@haywoodstreet.org. In every way possible, the Downtown Welcome Table aims to shine light on the inherent worth of everyone who walks through the doors. Fresh ingredients are lovingly prepared and beautifully presented. Flowers adorn each table and silverware is rolled in cloth napkins. We believe using products of high quality extends the notion that people have worth and so we partner with ethical companies that emphasize fresh and local, or artisan-made. A shining example of this is The Welcome Table Coffee Collective– a group of local roasters who donate fair-trade, locally roasted coffee beans on a monthly basis. If you have a culinary product or service that you are interested in providing, either by donation or at cost, we would love to hear from you! For more information, please contact Laura at laura@haywoodstreet.org. Consider joining the amazing list of restaurants and vendors who help make it all possible! 67 Biltmore, Advantage Direct Printing, Ambrozia, Appalachian Chic Food Truck, Black Mountain Ale House, Blue Dream Curry, Bouchon, Bun Intended Food Truck, Buxton Hall Barbecue, Cecelia’s Kitchen, Celtic Sea Salt, Chai Pani, Chiesa, Cheney Brothers, Chestnut/Corner Kitchen, Cucina 24, Cúrate/Nightbell, David Wilcox, Del Vecchios, Ecolab, Eleven 11 Creative, Farm Burger, French Broad Chocolate Lounge, Gan Shan Station, Geraldine’s Bakery, Green Sage Cafe, Gypsy Queen Cuisine, Homegrown, Luella’s BBQ, Lynne Harty Photography, Mamacitas Mexican Grill, Marco’s Pizzeria, Mellow Mushroom, Nine Mile, Out of the Blue Peruvian Fusion, Rhubarb/The Rhu, Root Down Food Truck, Rosetta’s Kitchen, Sodexo at Warren Wilson, Strada Italiano, Sunny Point Café, Swannanoa Cleaners, SYSCO, Table, Takosushi, The Bull & Beggar, Trader Joe’s, Twelve Bones, Ultimate Icecream, UNCA Dining Services, US Foods, Vinnie’s Neighborhood Italian, West End Bakery, Wicked Weed Brewing.